In our small place in CA (we go between here and AZ) we have limited room. I brought along some table top favs but only one "large" radio. This is a Scott Metro 16A that I purchased in pieces actually and a great friend made a cabinet for me. I'm listening to it now with an MP3 recorded with some great music, now the Rightous Brothers, dang can they sing. Other than that if we don't have it recorded it is off to ask Alexa on the "ECHO" to play what we want. The 6 table top radios in our computer room generally set quiet although with an antenna they will receive many AM stations. This picture was taken in AZ, it is now in CA in a much more cramped place. 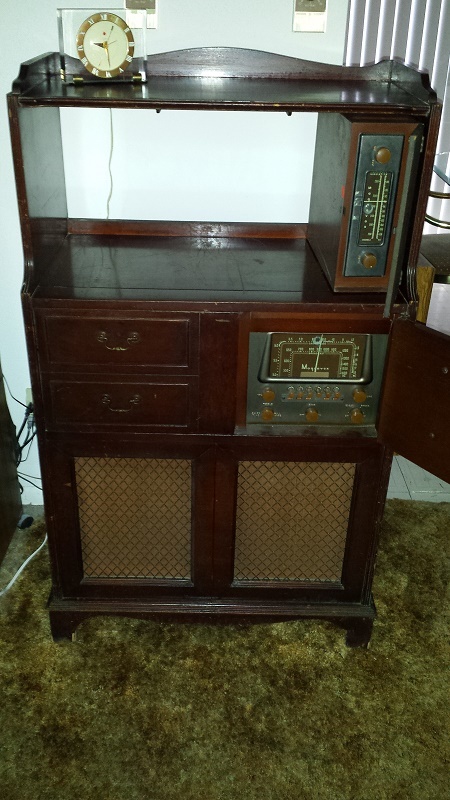 I have to say the Metro is a great sounding radio and I have restored 3 of the 800B Scotts and recently moved mine off to a friend in AZ. The Metro sounds every bit as good although it lacks SW and the power tuning which is cool. That is a nice set! this is what I have been listening to mostly this year with Mp3 recordings and the AM and SW receiver. I have a 50' hidden wire antenna with east west orientation. I get decent reception from each direction. Some european stations sound better than nearby Atlanta. I also listen using the FM converter. It is a pretty powerful unit. It is a Magnavox 153B 'Hepplewhite'. Both of the above are nice sets! Maybe we should start a Gallery for all the pictures? 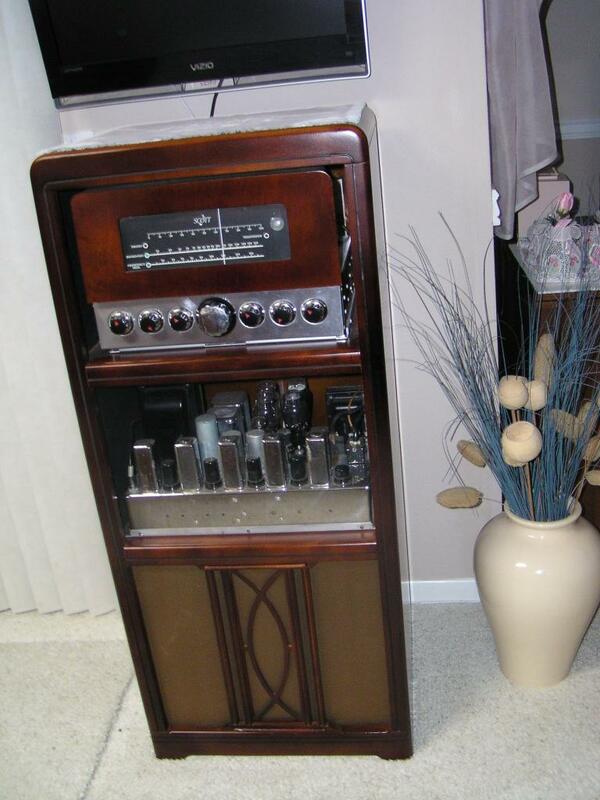 My wife listens mostly to her little Contemporary Magnavox console stereo, circa 1962-63. We have a 300 disc CD changer on our Concert Grand. When I am in the shop, I either listen to my Hallicrafters SX-110 or the Magnavox stereo currently undergoing restoration. 75X11 wrote: That is a nice set! this is what I have been listening to mostly this year with Mp3 recordings and the AM and SW receiver. I have a 50' hidden wire antenna with east west orientation. I get decent reception from each direction. Some european stations sound better than nearby Atlanta. I also listen using the FM converter. It is a pretty powerful unit. It is a Magnavox 153B 'Hepplewhite'. Hey, that's the 1946 model I have. Mine has the original leather bound surface on the bottom shelf. If you have the CR-198 chassis like mine, it has it's own amp in it. Actually, it's a great sounding set, and, reception is fantastic. Wildcat445 wrote: Both of the above are nice sets! Maybe we should start a Gallery for all the pictures? The owners of the computer that this forum is on don't allow much gallery, and, to get one, a monthly amount of unknown amount would have to be paid to them. That's the one. And you are right on the reception, too! No leather top on mine though. I guess they used the money for the FM converter. I wonder why we could not start a thread (not called "Gallery", but something else) and have people who would care to post their pictures on that? Make is a sticky or something and be done with it. I would think that if it was requested that the posts in the "gallery" were hosted with a link to the host (I post from Photobucket) there would be no overhead on the TRF server. Of course if the hosting site goes down, the links will not work. I could be wrong and often am! Photo bucket posts, and, picrue posts in the topic are allowed. Hey, could you find me one of those fm converters for mine?? Mine has the socket on the back that says fm. It may take quite a while to find a standalone FM converter, but in the meantime a solid state tuner can do a nice job substituting for the original. I replaced the input multi pin jack with an RCA jack to allow more flexibility with the input devices. I also changed the OEM FM converters' jack to an RCA for greater ease in connection and test and alignment. Here are some inexpensive tuners. I just used a 2 to 1 adapter to connect to the Magnavox while I was working on the OEM unit. I got mine for 7 bucks. Jerry, is that a manufacturer supplied cabinet for your set? I've seen them in different configurations, including built in layouts. It does show off the set to good advantage. 75, I was visiting a very good friend in NM and setting in the guest bedroom looking at a nice looking night stand. I like the design. I went home and took some measurements on the Metro's chassis and added enought for the speaker in height and he built it with his skill. I went up again to bring it back and put a finish on it. All fit perfect. It really needed something over the grill cloth and we thought the Scott 800B fretwork would look good. He has an 800B I restored for him and used it as a guide to fabricate a new one to fit the opening. I belleve all Metros used a phono and unlike the 800B, they have a couple filters for rumble and scratches which the 800 lacked, they spend a little more time on handling the phono. The front cover for the receiver I fabricated as the Metro didn't have a free attaching one like the 800B. 75, it is a one of a kind! PS: I view the Metro as an under appreciated Scott, I doubt they made as many as the 800B but at a lower price point. Well done! My Grandfather on my father's side was a electrical engineer with the electric railway between Indanapolis and Fort Wayne. He had an Auburn and a Scott. My father would tell me about them. He must've cut quite a swath in the tiny town they lived in.